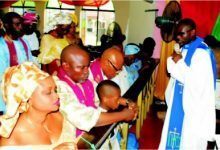 In recognition of God’s total blessings, favour and protection, the entire Iyariari House (Burusu), in Brown Major House of Finima community in Bonny Local Government Area of Rivers State on Sunday, 15th January, 2017 organized an annual thanksgiving at the famous St. Michael Christ Army Church, Finima, Bonny LGA. During the thanksgiving service the Vicar in charge of the church, Rev. Abinye Brown lauded the Iyariari family for thanking God Almighty for his goodness in the lives of their sons and daughters for keeping them alive to the year 2017. The Vicar thanked God that one of the illustrious sons of the family, Hon. Amaopusenibo Randolph Iwo Oruenre Brown was elected into the Federal House of Representatives representing Bonny/Degema constituency. The cleric charged Hon. Brown to live up to the expectation of the electorate. He enjoined the National Assembly member to deliver while praying for God’s wisdom to enable him to discharge his daily functions. The clergy further prayed for the blessings of God on the sons and daughters of Iyariari family. During the service the 1st lesson (1kgs 20:1-20) and the 2nd lesson (Matt. 13:44) were read by Goodman Brown and L/P Joy Abraham respectively. Speaking to newsmen the chairman of the Iyariari family, Sir. Dan Dappa Brown maintained that the Burusu House always organize annual thanksgiving and described this year’s thanksgiving as special because of the election of their son, Hon. Randolph Brown. He promised that the family will give their maximum support to Hon. Brown. In his speech, Iyariari family head, Wariopusenibo Hon. Tuonimi Iyariari passed a vote of confidence on the Federal lawmaker. He thanked Governor Nyesom Wike, Amaopusenibo Hon. Rodaford O. LongJohn, Hon. Mrs. Toru Ofili, Dr. Mrs. Ipalibo Banigo, Hon. Dr. Simeon E. Hart amongst others for their more support given to him Randolph Brown. In his remarks, the National Parliamentarian, Hon. Brown promised to deliver the dividends of democracy to the people of his constituency. He appreciated the Amanyanabo in council, King Edward Asimini for his support. In their separate speeches, Hon. Benjamin T. Jumbo, Mr. Brown Adatu Adori, chairman Solidarity Front and Dr. Idawari Brown described Hon Randolph Brown as a good man that has the people at heart.